The route from Passau, on Germany's eastern border, to Vienna is one of the most popular cycle paths in Europe, and it's no wonder! This stretch of the Danube carves its way through a thousand years of history; 60 dramatic castles and palaces lie along the river and the ever-changing landscape is a kaleidoscope of fertile plains, narrow gorges, lowland forests, bird-rich marshland and acres of picturesque vines. Much of the cycling is on the old river towpath which is now lovely, flat and surfaced; previously up to 60 horses strained to drag heavy cargo boats upstream against the powerful current! Today, dozens of farms and cafes offer waterfront lunch stops as you cycle between sun-baked villages and wayside stalls piled high with apples, peaches and plums. Most cycling days are completely flexible, as local boat and train services are excellent, cheap and cater brilliantly to cyclists. Highlights of the route include the bustling mediaeval centre of Linz, the immense C11 Baroque abbey at Melk, and UNESCO-celebrated Krems. As the river meanders down to the Viennese woods you'll be met by Vienna, the waltz capital of Europe, which rises like a vision from the plain. Our hotels are all individually charming with those at Passau, Schlogen and Tulln on the riverbank, and range from a quirky C15 convent in Linz, to magnificent 4-star luxury in Krems, with two pools and a world-class spa! We have included two nights in Linz, Melk and Krems to allow time to explore at leisure. It's easy to add nights before or after the tour to enjoy time in Passau and Vienna, and you're looked after throughout by our expert local agent Greenways Travel. Read more about this holiday in Timeless Travels Magazine. 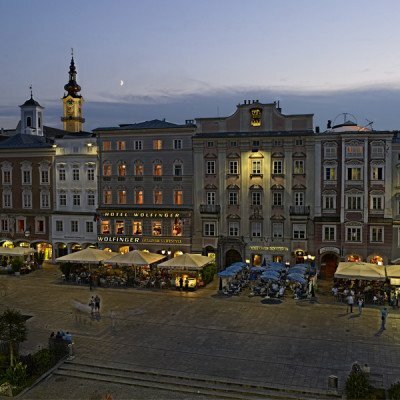 Arrive at your riverfront hotel and then enjoy dinner in the heart of the old town tonight. After receiving your bike and welcome brief, pedal east to Obernzell, famous for pottery, before popping into the Keramicmuseum in a riverside castle. The scent of wood smoke and grilled trout may tempt you into lunch as you cross into Austria where the valley is steeper and cloaked with oak woods. On reaching the hotel, relax in the pool before dinner on the terrace watching passenger boats sparkling with fairy lights cruise past. Spot kingfishers today in the Donauschlinge Nature Reserve. Stop and enjoy the views at the picnic tables that dot the waterfront before you reach Aschach's frescoed waterfront. Catch the Linz ferry, or follow the towpath through reed marshes to Ottensheim beach for a swim. Hop on the train here and in no time you'll arrive at your hotel, an ancient convent, in Linz's extravagant town square. Linz's ornate Baroque architecture in the Hauptplatz leads to boutique shops on LandstraBe, and to the old Schlossmuseum, creaking with ancient armour. Browse the Lentos Art Museum before, perhaps, catching the train to explore tiny C12 Enns, Austria's oldest city. Or, for a poignant history lesson on the Holocaust, visit the WW2 Nazi camp at Mauthausen. After a 30 minute transfer (included) to C16 Grein, you'll pedal through orchards as the Danube Valley becomes more fertile, before stopping for lunch in Ybbs, home to a quirky collection of penny-farthing bicycles. The hilltop twin towers of Maria Taferl appear and Melk's monastery looms high above as you pedal towards Margaret Ebner's welcoming family hotel in Melk. Melk's massive Benedictine monastery was rebuilt in 1683 and the interior abbey is as breathtaking as the countryside views from the rooftop terrace. For a day trip, cycle to Schloss Schallaburg (8km return), one of the finest Renaissance castles north of the Alps, where you can stroll in the magnificent rose gardens and enjoy acclaimed cultural exhibitions. After dinner, enjoy wandering Melk's atmospheric cobbled streets. Today you coast along the UNESCO Wachau Valley, a necklace of villages and vineyards, anchored by pretty churches along the north bank. Each is charming, especially Durnstein where Richard the Lionheart was held for ransom in the craggy hilltop castle. Admire the statuette, Venus of Willendorf, dating back to 23,000BC, before arriving in Krems for a splash in the pool, and candlelit dinner on the terrace overlooking the valley. Krems has one of the most beautiful historic centres in Europe and is packed with interest, from the Wine Museum housed in a restored Dominican monastery to the C13 abbey that exhibits paintings of Martin Johann Schmidt. You can cycle out to Schloss Grafenegg (14km away), a gargoyle-encrusted Gothic castle set in 85 acres of parkland, perfect for picnics, or just relax in the fabulous hotel spa and pool. Freewheel down river to Tulln, known as the 'Town of Roses'. Pop into the Roman museum which is packed with artefacts, and dine out tonight amid the fountains, statues and ornate buildings that crowd the pretty centre before returning to your waterfront hotel. Coast along the last stretch and relax over lunch in imperial Klosterneuburg. Then cycle along Danube Island before continuing to your hotel, right in the heart of the city. Enjoy dinner out in Vienna's lively centre which is breathtakingly floodlit at night! Please note that cycling helmets are compulsory in Austria for all customers under 12 yrs. As we are unable to provide these, we strongly recommend that you bring your own. During your holiday you stay at the following hotels. If you'd like to extend your time at any of these or, if you'd like to enhance your stay with an upgraded room, just let us know at the time of booking. If you'd like to keep your bikes with you for any extra nights we can arrange this for you for just £20 per adult per day. 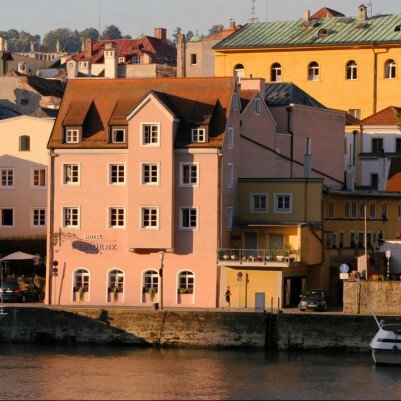 The Hotel Residenz is on the waterfront in Passau facing the Danube River. The Hotel is a renovated merchant's house and is over 400 years old, although today you would never guess as it has been decorated in an attractive contemporary style, while keeping some original features like the barrel vaulted ceilings and tile floors. There is a guest lounge and library for relaxing in as well as an outdoor breakfast terrace, from where you can watch the Danube passenger boats come and go by the dock below you. The bedrooms are contemporary with light wooden furnishings and modern bathrooms. There is a computer in the lobby where you are able to use the Internet. Room upgrades: Premium room . 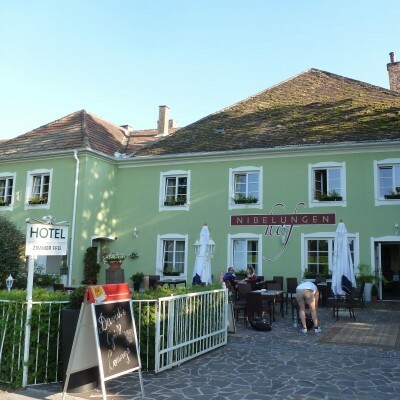 The Hotel Donauschlinge and the Gugler Family have cornered the market on this stretch of the River Danube and have become a favourite pit stop on the way between Passau and Vienna for almost every cyclist making the trip. The Schlogen meander bend is a famous landmark on the river and this attractive waterfront hotel is perched right on the corner with river views from most of the rooms, and a great panoramic dining terrace where you can have dinner. The bedrooms are spacious with river views and balconies, so on arrival you can take a dip in the indoor pool and then relax with a view of the river. In the centre of Linz's spectacular town square the Wolfinger Hotel blends in perfectly. From the outside it looks like a townhouse with its grand facade and historical charm. Inside the design is very curious. The building used to be a convent in the old days, and it has now been tastefully converted into a cosy and quirky city centre hotel. The public rooms include a lounge and reception area where you can access the internet, and a lovely breakfast room overlooking the Hauptplatz outside. There decor is equally as grand, with antique furniture, carved chairs and cabinets overhung by chandeliers. The bedrooms are decorated in the same style, although some rooms have been given a more modern feel with smart new wooden flooring and Persian style rugs. All have phones, satellite TV and hairdryers. Superior rooms are larger and have a view over the main square. The Ebner's Hotel in Melk is located just off a tiny cobbled square below the giant and world famous monastery that towers above the town. The hotel is built on a steep hill, though you don't notice this from the street, so it is taller inside than it appears outside. The public rooms nearest the street are given over to a stube style lounge and bar area, and there is an attractive terrace out the front with views of the monastery at dinner. At the back of the building there is an even larger terraced area for breakfast and dinner, and several dining rooms inside to cater for guests. Upstairs the bedrooms are smart but simply furnished, with many rooms overlooking the dining terrace at the back of the hotel. Rooms all have hairdryers, satellite TV and direct dial phones. 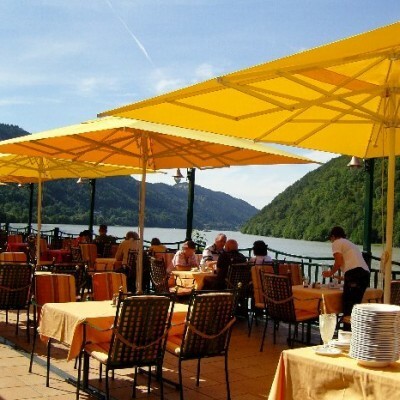 The hotel is as central as it is possible to be in Melk, so it is ideal for exploring the town. The Apartment is 80m2 with 2 bedrooms, 1 bathroom and 1 extra toilet, a large living room with stereo system and tea and coffee making facilities. The Steigenberger in Krems is a real treat. Once you have negotiated the short, steep hill up to the front door you really can relax. Apart from the many bedrooms, the hotel has one of the most luxurious spa facilities we have ever seen, with both an outdoor and an indoor pool. The dining room is gorgeous, spilling out onto a panoramic terrace with views of the surrounding vineyards and over the spires of the old city of Krems. Bedrooms are modern and beautifully presented with lots of wood and high quality fabrics so everything feels very luxurious. Please note that twin rooms are not available at this hotel. Room upgrades: Deluxe room or Junior Suite. Deluxe rooms are larger. Junior Suites are very spacious, light and luxurious. The pretty riverfront town of Tulln is your last stop before you reach Vienna. Originally a Roman settlement, the waterfront has been preserved as a series of attractive parks and gardens; the two storey hotel is slightly set back from the riverside. Inside it is attractively decorated in a homely style, with the reception and lounge area decorated with a full wall of books either side of a central fireplace, with comfortable sofas to relax on. The bedrooms are all individually decorated; most have wooden floors, repro antiques, satellite TV and hairdryers. The hotel is just a short walk from the centre of Tulln, where there are several grand churches, museums and restaurants to explore. Room upgrades: Bon Vivant room. The Bon Vivant rooms are larger and are all individually and stylishly decorated. The location of the Hotel Austria could not be more central in Vienna. The Fleischmarkt is within walking distance of all the city centre attractions, and the opportunities for dining out are plentiful in the evenings. The hotel is squirreled away up a small alleyway so looks quite unassuming. It is an enormous traditional building with a grand spiral central staircase. The public rooms on the ground floor are all very high with an atmosphere of faded and comfortable rather than modern grandeur. Ancient maps of the city hang behind reception and reds and crimsons form much of the decor, with antique furnishings dotting the lounge from where you can access the internet. Bedrooms upstairs are off long corridors, and have high windows and dark wooden furnishings and velvet chairs. All come with satellite TV, minibars and tea and coffee making facilities. Comfort double rooms are larger than the standard double rooms, with chairs or a sofa provided. 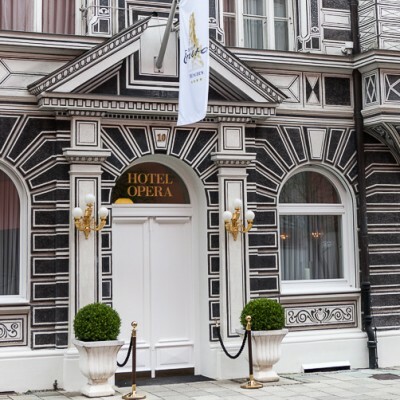 The Hotel Opera is situated in the Lehel district of Munich, the area has a village feel to it, but is just a 15 minute walk to the main centre of Munich and a 20 minute walk to the Englischer Garten, Munich's huge leafy park. The hotel has a wonderful Romanesque facade, and the building itself dates back to the C19, damaged in the war the building was bought in 1968 by the present owners who took 8 years to painstakingly restore and renovate the building. Today's hotel is a nice mix of modern and old, with lovely airy rooms and and a relaxing tranquil garden patio. Rooms have all mod cons and some come with balconies, the hotel also owns a couple of superb restaurants close by. Breakfast is served at your table with a choice of cold meats and cheeses or croissants and fruit and the option to order freshly cooked eggs. Transfers from Passau train station (pay locally, allow approx 8 euro), however return to Vienna airport at 11:30 is included. On paper the distances seem a bit daunting but in reality lovely gentle cycling with some spectacular scenery. Varied, interesting holiday. Easy cycling, but bikes a little heavy and saddles not as comfortable as usual. You can catch an earlier train from Munich than the one stated on the ticket, although Headwater advised otherwise. We did check with a guard before travelling. All the breakfasts were great. Typical Austrian fare is a little heavy, especially the dumplings! An extra night in Passau meant that we could enjoy the organ music at midday and we thoroughly enjoyed our extra nights, two, in Vienna. Enjoyable, comfortable rides easily achieve by two 70 year olds. Accommodation very good although food somewhat variable. From Passau to Vienna is an unforgettable experience. Impossibly beautiful countryside, vineyards and medieval villages are only some of the highlights you enjoy on level cycling paths and quiet streets. If history, art or music is your thing, there are also countless opportunities to indulge during stays at Linz, Milk and of course, Vienna. Our only question mark came at the end of the trip, when we felt that more time should have been scheduled in this incredible city and less time apportioned to Krems and Tullin. A lovely trip. Easy cycling, attractive scenery, good bikes and excellent accommodation. All this plus good weather and wonderful companionship made this my best-ever Headwater experience. Good organisation, bikes excellent, hotels well chosen, guidance and maps very clear. Steady and easy cycling between 25 and 35 miles each day. We didn't use the train but carried on cycling right into Vienna - magic. We really enjoyed our non-cycling days too, all in well-chosen places. A great holiday. Headwaters holidays came highly recommended. We could find no fault with the trip. Our scoring of the recommended hotels was 'excellent' but where we marked 'good' it was usually because the other hotels (breakfast) were exceptional. It would have been a good idea (on our last day of cycling,Tulln-Vienna) to suggest cycling on the south bank & visiting Klosterneuberg then crossing on the small ferry (we noticed) to the North bank to join the Donauinsel. It is not a criticism by any means. We didn't opt for any of the train/ferry alternatives suggested although they were very useful options. Cycling into Vienna on the Donauinsel was a joy, imagine cycling into the heart of a big city on a traffic free (20km) island, on the Danube, it was truly amazing! Thank you. Distances appear long, but cycling is really easy and distance is not an issue. All on dedicated tarmac cycle paths. A Headwater cycling holiday is by no means a cheap option. . Given the quality of the bikes, the route notes and suggestions for 'rest' days, however, we rate these holidays highly and feel safe and supported throughout. The fact that we have just completed our 5th holiday with the company must surely indicate our overall level of satisfaction! Keep up the good work, Headwater. Nothing quite compares to the freedom of travelling by bike. It's liberating and quite intoxicating! There was a weakness in the bus and train transfer information! A very enjoyable holiday which surpassed expectations. Bikes, Information, Logistics, Food and Accommodation were all very good. The price is on the high side and we booked extra nights and travel ourselves as the additional charges from Headwater were too steep. Would recommend to friends. Exactly as it said it would be. Well organised. Efficient. comfortable. A gentle cycling experience along the Danube and through the Wachau vineyards, with options to shorten the day's cycling by using boat, train or minibus if desired. We had a fab holiday. Everything went perfectly. The trail was so pretty and interesting and not as difficult as either of us expected. Austria was lovely. We left Passau and saw the different waters of the rivers Danube and Inn merge. Soon afterwards we were in the countryside, cycling by the Danube and along verges and meadows of wild flowers - scabious, chicory, vipers bugloss, clover etc. It was fascinating to see the scenery, the agriculture and the Danube change as we progressed. The villages were picture-book pretty, each with their own history. The towns we stayed in were all delightful - Linz, Melk, Krems and Tulln. Schlogen was quite lovely on a meander of the Danube, we watched the light change on the water and cargo boats go up and down river. Good pre-booked accommodation, excellent notes and seamless baggage transfer between locations meant that we could focus on enjoying our cycle ride along the Danube. We would have no hesitation in recommending this holiday to potential future travellers. The cycling from Passau to Vienna was a wonderful experience. We were sorry when we had to hand back the bikes as we enjoyed the cycling so much. The holiday was well planned with two day stops so that we had time to explore the beautiful towns en route. Everything was well organised and supported. Avoid the hotel at Tulln until they have finished rebuilding it! On the Krems to Tulln day there was no cafe in the village specified in the notes but an excellent cafe was found later on right next to a power station. We thought the cycle into Vienna along Danube island was brilliant and should be encouraged. The local rep persuaded us to ignore the advice to take the train from Ottenshein into Linz so we cycled it and it was awful! Thank you for taking the time to complete your post-holiday feedback. We are sorry if you were inconvenienced by the building work taking place at Hotel Nibelungenhof, please be assured, we monitored these works closely and would have changed hotels had we felt this was necessary. However, whilst the outside works were visible, we did not feel this affected the overall stay for our customers, I am however pleased to advise that this work was completed over the summer . We were also sorry to hear you felt the local agent gave you poor advice and you found the route awful. We have asked that they do not make this recommendation for future customers. We have received no further constructive feedback in either of these areas. In closing, we hope that despite these disappointments you had an enjoyable holiday overall. We would like to thank you for choosing to travel with Headwater and look forward to welcoming you on another of our holidays in the future. Overall we found the holiday a great break for us. The route, notes, hotel locations, things to do etc all added to the enjoyment. Everything was well explained and set out for us. Great cycle holiday on easy cycle paths with quality bikes and excellent hotels. Excellent accommodation. Confidence with the equipment and support. Good maps and route details very comprehensive. Cycling down the Danube is great as the Danube cycleway is either a dedicated path or where it runs along side a road it is separate and safe. An added advantage is that it is flat and well surfaced. This was my fifth cycle holiday with Headwater, and it was the most enjoyable. The cycling is very easy, and the route is very clearly marked, so there is absolutely no navigation skill required. Unlike some of the tours in rural Italy or Spain, there were numerous, widely-varied eating establishments with long opening hours right along the cycle path. The cycling path is flat, but it passes through some varied and hilly terrain. There are opportunities to make short (and possibly hilly) detours to see some pretty villages and interesting sights along the way. One very moving side trip is to do the short day trip (about 50 km round trip from the hotel at Linz) to the memorial at the former Mauthausen concentration camp. 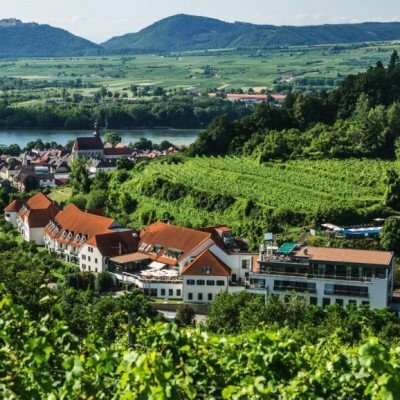 The high point of the tour is when it passes through the Wachau Valley, which is one of the loveliest wine growing regions I have cycled through. I did the entire ride, even covering the short stretch from Linz to Grein, which the normal tour bypasses by shuttle van due to its being thought too industrial. Also, the tour guide recommends taking a train into the heart of Vienna in order to by-pass a slightly grimy and graffiti-covered stretch of the outskirts of the city. I did not find this stretch particularly objectionable, and there is a certain satisfaction to completing the entire cycle path from Passau to the heart of Vienna. This would be a perfect ride for someone who is uncertain about committing to a bicycle tour. There are river boats and trains that allow one to skip cycling portions when the weather is bad or one is too fatigued. The cycling could not be any easier, and the maps and signs along the way make it all quite fool-proof. Note that Headwater will supply participants with a spiral bound book that contains high resolution maps for the entire route. This book is easily ignored as the usual Headwater instructions are so well done, but the book does contain some historical tidbits and also suggestions for interesting detours, so it is worth a read. A note in closing; the Passau-Vienna path is said to be very busy in the summer. I did my tour in late September and the path was wide open. Only the Wachau Valley section had any significant bicycle traffic. Very easy and enjoyable cycling through lovely scenery with excellent accommodation and many places of interest to visit. It might have been better to have an extra day in Vienna at the end of the trip instead of a free day in Krems which was not as exciting as Vienna. The weather could have been better too!! A fantastic holiday for a family with teenagers. Easy but very enjoyable cycling in stunning countryside. The arrangements were very good and instructions easy to follow. However, we found the bikes to be very heavy, and the crossbar on the ladies' bike was far too high, to the extent that my husband had to help me on and off the bike as I could not tilt it far enough towards me to get my leg over the crossbar without it falling on me (as it did on one occasion, resulting on me banging my head (thank goodness for my cycle helmet) and skinning my elbow! Very easy and relaxed cycling with virtually no need for the notes as the Donauweg is so well sign-posted. Lots to do on the stay put days. Cycling easy even for us oldies,nice hotels,beautiful scenery and relaxed pace. Every day was different. The bikes were excellent as was the luggage transfer. The mix of cycling and non cycling days was a bonus and allowed one to explore the local towns. Following a river downstream provided continuity and progression as it made its way down stream. Our cycling holiday was just the BEST! I am a non-cycling person, afraid in traffic, and not especially into sport and fitness. My husband is Mr Fit, and cycles quite a bit. This holiday was so much fun for both of us. Well within my capabilities, and although not very demanding, the cycling was enough to keep my husband happy. Can't wait to book another Headwater holiday. This was an easy ride for us and I would say ideal for less experienced cyclists. Everyone we met in hotels and restaurants was friendly and helpful. An exceptionally well designed tour, which includes valuable 2 night stops at the en-route hotels in Linz, Melk and Krems, the first two of which are really interesting to explore. The daily distances were will within the capabilities of these two 68-71 year old occasional cyclists. The Danube routes were well signed and easy to follow. The cycle route along the Danube from Paschau to Vienna was excellent - easy cycling, well signposted and extremely beautiful. We passed pretty wild flower meadows, dense forested slopes and wide terraced vineyards. The route took in many delightful towns and villages, with their pretty squares, narrow cobbled streets, castles, cathedrals and monasteries. Vienna is amazing and definitely worth staying on for a few extra days! The hotels were in great locations and the meals were very good. Headwater and their local representatives arranged a great trip for us - their customer service and attention to detail was excellent. Thank you! Lovely flat (mostly) easy cycling. Very clean hotel rooms, most with a nice view. Good food. Hugely enjoyable, a great adventure on an achievable scale. A very easy, relaxing and stimulating holiday. At times we would have liked to ride slightly longer distances, but accept that the intermediate hotels were all, in their different ways good. Another great cycling holiday. Thoroughly enjoyed our trip along the Danube. Cycling just at the right level of effort. Food grew, people great. Best organised cycling holiday so far. We enjoyed the holiday, and the hotels and their service were generally very good or excellent, apart from at the Hotel Donauschlinge, where the staff were not as friendly and we felt they hurried our evening meal, bringing the second course before we had finished the first! In our view, the Hotel Zur Post in Melk was by far the most efficient, with the most helpful staff. The Steigenberger in Krems, although a very nice hotel, had less character (much more a standard 'chain' hotel) and our table in the dining room was tucked away in a rather gloomy corner, rather than the main restaurant – unfortunately the weather was not good enough for us to have a table on the terrace. We were impressed by Greenways Travel, who were very efficient and prompt about delivering our bikes, transporting us from Linz to Grein and then collecting the bikes at the end. They also provided a mobile phone for us to contact them if we needed to. We were unprepared for quite how flat the ride would be, and with hindsight should perhaps have opted for something a little more challenging. I think we expected it to be more like the Moselle ride, which we did with Headwater a few years ago and which rolled up and down a little – our 'best bit' on this holiday was therefore the ride from Melk to Krems through the Wachau, which was not totally flat. The rep, Erhard, was the best we have ever had and produced lots of good information and even mobile phones for emergency use (not needed). The Schlogen hotel has the most dramatic location on a bend in the river that you can imagine, and it is worth the tough climb up the hill behind to view it from the top. Vienna is a big city in every sense with lots of grand buildings to see, and the trams make them very accessible, which we discovered thanks to the superb staff on the hotel recepion who know their town well. The route down the Danube is beautiful and ever changing and full of interest. Outstanding experience in terms of cycling, locations chosen, landscapes and scenery, cultural activities and overall enjoyment. We travelled to Passau via Munich Airport followed by an over 3-hour journey by bus to Freising station, train to Passau and taxi to the hotel. We purchased on-line a Bayern-Ticket for 27 Euros for 2 people which included both the bus and train journeys. We are both in our late sixties and found the cycling easy, although adjustments had to be made for the weather. It rained on the first day but after that the weather was hot and sunny necessitating early starts. The cycle paths were clearly signed so it was easy to follow the route and German and Austrian drivers are courteous to cyclists so cycling in towns was not a problem. The hotels were varied and well chosen and near the main attractions, the only exception being the one in Krems which was up a steep hill, but the hotel's facilities make the climb worthwhile. The instructions suggested going by train from Ottensheim to Linz but the cycle path was well separated from the busy road so cycling to Linz was not a problem. Similarly, the instructions suggest travelling by train in to Vienna but the cycle route was easy and the graffiti no worse than you find on the outskirts of most cities and it cheered up the drab concrete walls even though most of it was not up to the standard of Banksy. The food provided by the hotels was generally good and the hotels were near to restaurants when evening meals were not provided. Easy cycling - with options to reduce length every day (only used once when one person unwell) - hotels in interesting or beautiful locations with plenty to see - good white wine area with everywhere having choice of wines by the glass (125ml) at reasonable prices. This was the best Headwater Holiday so far . Almost the entire route was on flat dedicated cycle paths or through quiet country lanes with little or no other traffic. Each day's cycling was easy and on average only about 25 miles. ( my wife and I are OAPs and we managed each day with no problem). The real bonus with this holiday is reaching Vienna at the end of the journey. I would recommend an extra night in Vienna before returning home..
An excellent holiday cycling 285 KM from Passau to Vienna along flat safe routes. The Tulln hotel was a bit basic and the train journey to Stein was a pain but probably necessary. We followed the reps advice and went into Vienna using the island route which avoided the train route suggested. Overall the holiday ticked all the boxes as is usually the case with Headwater. Thanks, we will be back next September with our friends for another adventure! This was an excellent, well designed, well organised holiday with very good back-up from Greenways Travel. After having many successful holidays without problem with Headwater Booking we were surprised to have difficulties getting: the rail return details confirmed; the invoice correct; the correct Reginal booklet sent through (3 tries); and the return transfer was still incorrectly notified to the local representative. Having said that your agents, Greenways' organisation was excellent leading to a successful holiday. A virtually hill-free ride through pleasant countryside neighbouring the River Danube, punctuated by stays in excellent hotels in historic towns and cities. No shortage of shops, castles, palaces, museums, and last but not least - coffee and cake shops. The challenge is to not gain weight! Wonderful scenery, cycling and wholly relaxing. We really enjoyed the whole experience. We had a thoroughly enjoyable trip along the Danube. Our first cycling holiday and generally it was a really good experience with an interesting variety of hotels. Beware of eating half board as in some hotels we felt we were treated like 2nd class citizens. Passau to Vienna cycling was an easy cycle ride ,staying at superb hotels amid beautiful towns and country-side . Cycling very easy! Level or downhill on tarmac. Hotel in Tulln is not 4 star! Although it was OK and had superb position, compared to the ratings of the other hotels on the trip it should be nearer to a 2 star. An excellent route - distances well judged for the terrain (easy) and, because the tracks are so well signed, the route notes are almost unnecessary. Very well presented and maintained bikes. Hotels are obviously selected for location and in some cases there is little choice. All were clean and reasonably comfortable and, where evening meals were included, they were excellent - and some were outstanding. The only thing that Headwater couldn't do anything about was the weather - we cycled just a couple of days before the dreadful flooding that swamped the entire route. Every thing went smoothly, pity about the weather! Every two days from 25th Apr 2019 to 12th Oct 2019, for 10 nights. All dates are subject to availability, please contact us to check. It is possible to hire electric bikes for this holiday at a supplement of £200 per person. As these are available on a first come first served basis, we recommend early booking to avoid disappointment. It is possible to hire tandem bikes for this holiday at a supplement of £95 per bike. As these are available on a first come first served basis, we recommend early booking to avoid disappointment. Due to the tailor-made nature of our holidays, we need a little more information in order for us to check availability for Passau to Vienna Cycling. Simply complete the form below and a member of our sales team will contact you (when it's most convenient for you) to provide availability information, travel options and an accurate price. Of course there's no obligation, but if you do wish to proceed with a booking they will be on-hand to assist you throughout the process. When should we contact you Today 9am - 1pm Today 1pm - 5pm Today 5pm - 7:30pm ---Tomorrow 9am - 1pm Tomorrow 1pm - 5pm Tomorrow 5pm - 7:30pm ---Thursday 9.30am - 1pm Thursday 1pm - 5pm Thursday 5pm - 7:30pm ---Friday 9am - 1pm Friday 1pm - 5pm Friday 5pm - 6:30pm ---Saturday 9am - 1pm Saturday 1pm - 3:30pm ---Please reply by email We can call you when it's most convenient for you, or contact you by email if you'd prefer. During busy periods we cannot always guarantee a specific call time but we promise to try our very best.